Jeff and I were caked with mud. We had rented scooters that morning to explore the surrounding areas of Sapa, and visit the villages of the local tribes of Vietnam. 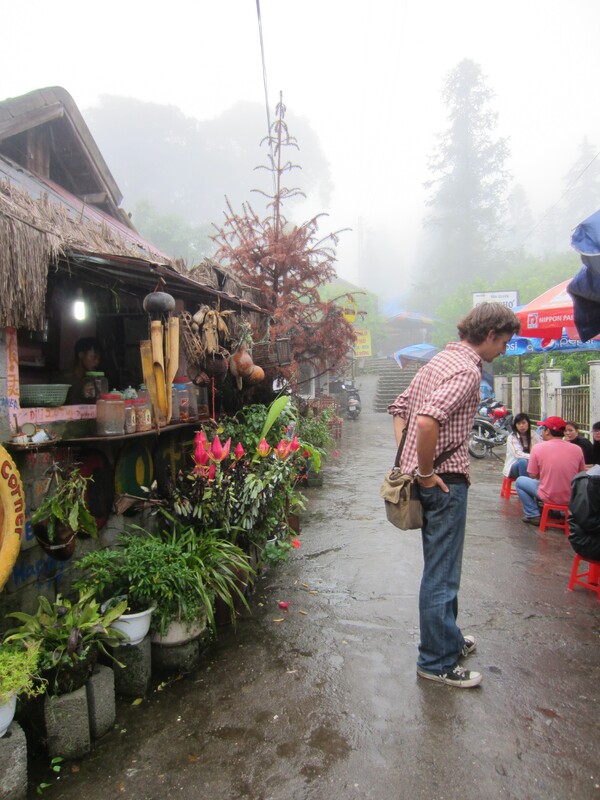 With engines running and wet weather gear on, we started down the long road through the Sapa province. 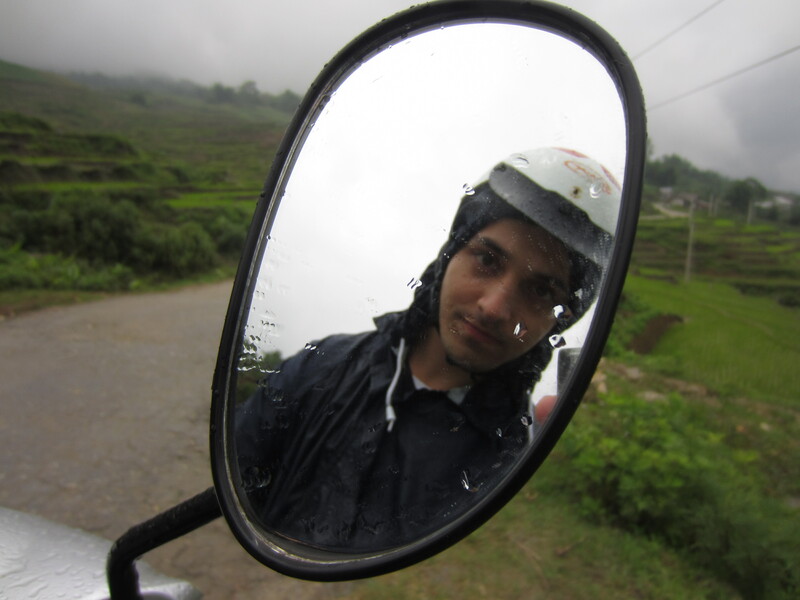 A fine rain sprinkled down through the mist, covering the ground with a slippery film and stinging our eyes as we rode. Not far from the town, the rain ceased and the fog lifted it’s porcelain veil to reveal the view from atop the winding mountain pass. Rice paddies in their hundreds decorated the valleys and the hills, each one a unique amoeba shape, stacked like bedroom drawers filled with grass. At the time, the road quality seemed poor; sealed asphalt acned with potholes and areas partially washed away by rivers and waterfalls. Past Black H’mong and Red Dao tribespeople, beautifully dressed in long dresses, bright multicoloured woven arm and headbands, and gumboots, the road began to grow muddier. The scooters, (The Boss – Jeff’s scooter, and Magnum – Derrick’s one), were not suited for offroad, as their tiny wheels swerved and chewed through the sloppy mud tracks, mud-filled shoes required to steady ourselves. After a beer stop at a small roadside bar, we picked up a passenger, a well-dressed Vietnamese girl in a casual black suit who needed a lift to Sapa. She rode on the back of Jeff’s bike and played with her phone, but her tenure with us did not last long. After a particularly rough, muddy section of riding, Jeff had a flat front tyre. Through some uncanny cosmic luck, a mechanic was only a minute down the road, and whilst Jeff’s damsel in distress hitched a new ride, our female mechanic, sporting a polka dot dress instead of the usual blue overalls, fixed a new inner tube. As the final section back to Sapa stretched out, we sped up, catching the beginnings of new rain, hungry for a hot bowl of pho. The legendary travellers are together once again !! What a fantastic blog you’ve got. I’ll definitely be looking forward to updates. Our present location couldn’t be much different; other than we’re both currently in Asia – Hong Kong in fact. BTW, did you andJeff see us waving as we flew over Hanoi :-)? Here we’re surrounded by 40-storey skyscrapers, with 7 million people packed into an area less than the Central Coast coastal strip. PS: Once I’m back in OZ, I’ll send you and Jeff a list of Belgian family members (mostly my dad’s side), who would love to meet you/put you up.